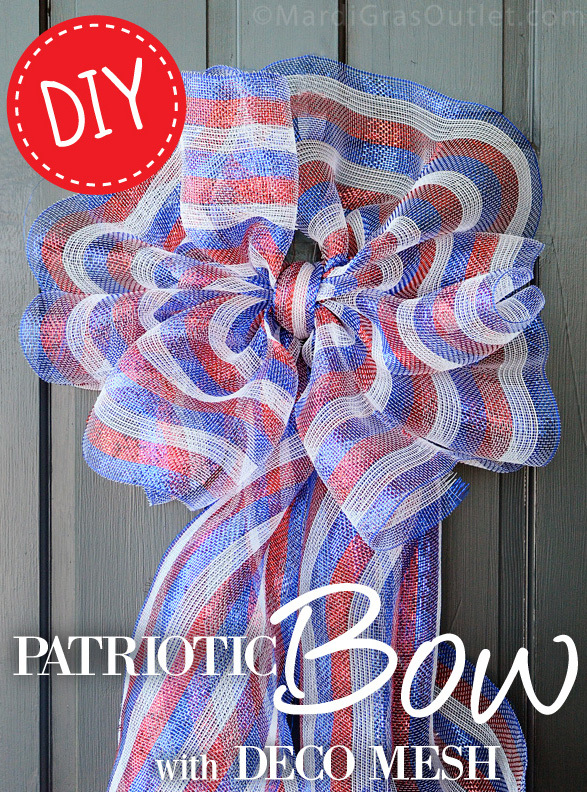 Dress your door, porch railing or parade worth bike in red, white and blue with this large patriotic bow. This easy DIY bow tutorial shows you a fun, new way to create a large bow using 21" wide red, white and blue striped mesh. 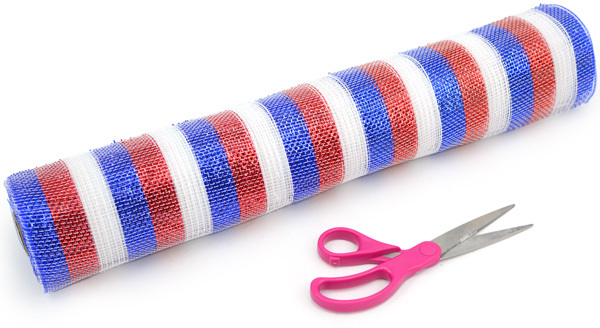 Making this large, red, white and blue decoration is very easy, even for non-crafters. 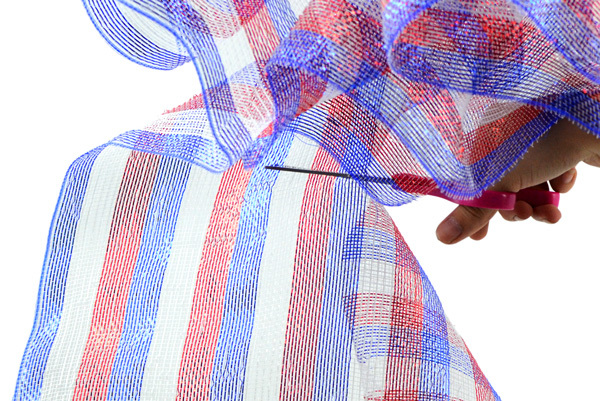 No special skills or supplies needed- just your hands and a wide deco mesh or fabric. 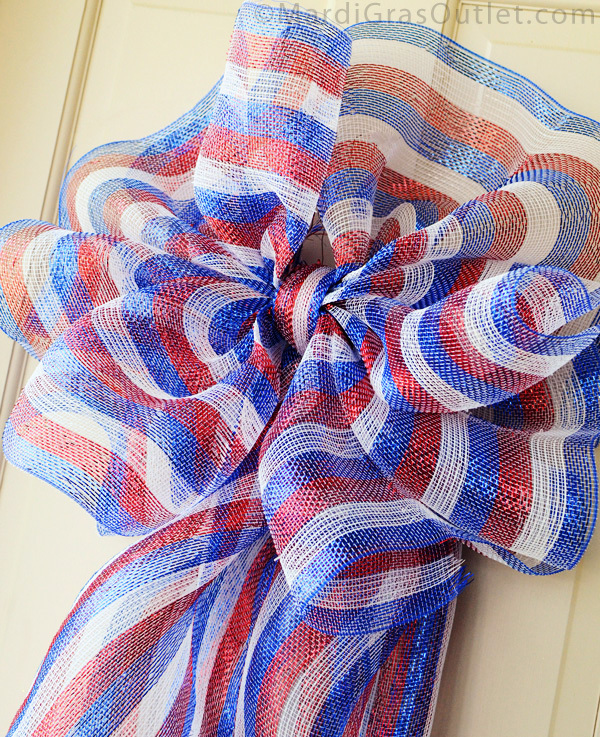 Fourth of July parades and parties are the perfect place to show off these big bows and your patriotism- so get crafting! 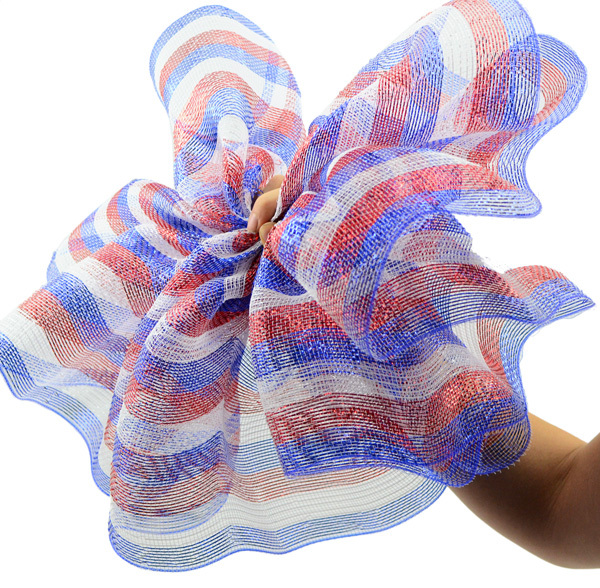 Deco Poly Mesh is a type of soft plastic netting that holds a full shape, allowing you to easily make wreaths, bows, garlands and more (see our tutorials page). 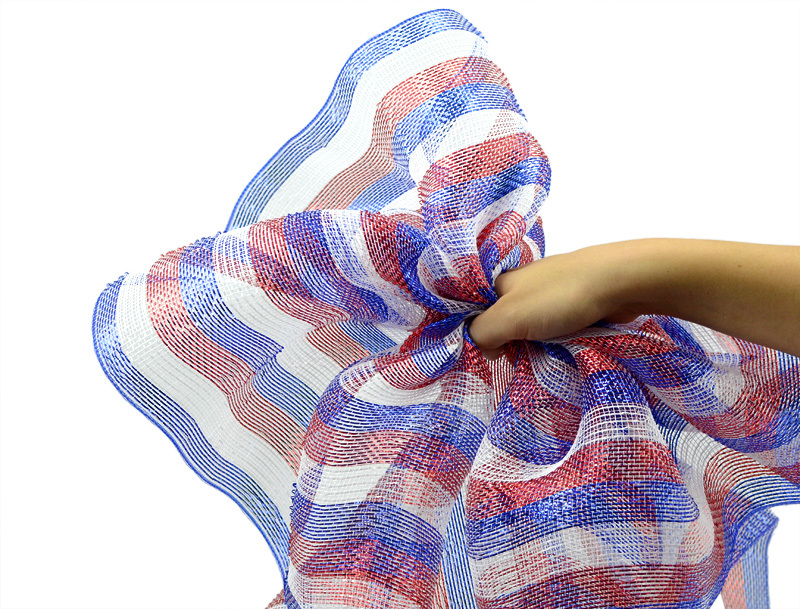 Deco Mesh also comes in many colors, patterns and styles, including the red, white and blue striped mesh used here for this patriotic bow. 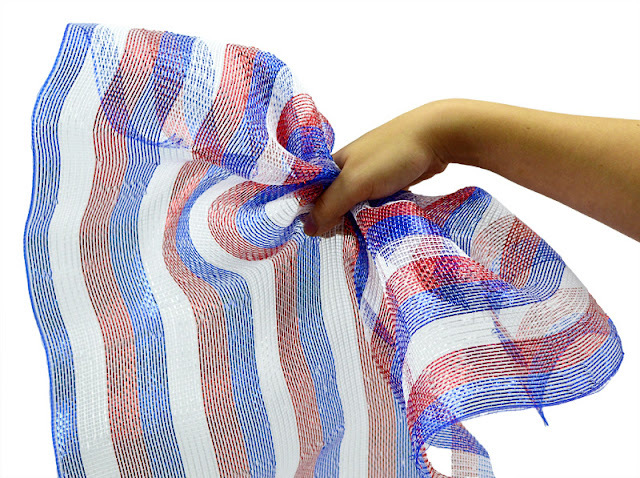 One roll of deco mesh will make about 2 large bows, 3 if you make the tails shorter and the top less puffy by using less mesh than shown in this tutorial. We also made a different type of bow with 10-inch wide mesh, instead of 21-inch wide mesh shown here. Click here to see that tutorial. Cut a length of deco mesh that is about 6 feet long. Hold it at the center, and straighten out the tails. Set the bow tails aside for securing the bow top after these next steps. Using a new length of deco mesh, make the bow top. Take the end edge of the deco mesh roll and hold it at the center. Start gathering the mesh, folding as you bunch the mesh into your hand as you go down the center of the mesh. Keep gathering, always staying at the middle of the width of mesh, parallel to the two long sides of the roll. You should start to see a bow starting to form. This bow used about 6 or 7 feet of deco mesh for the top part. 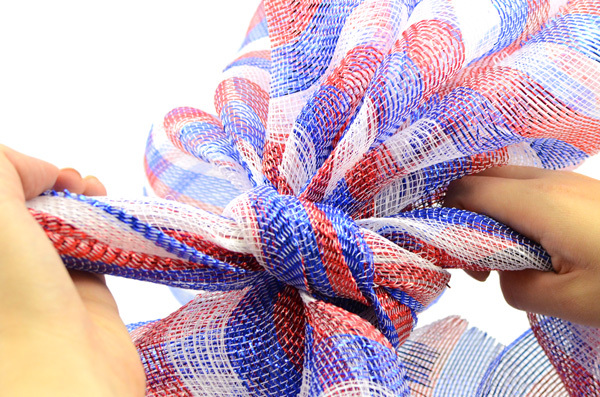 Once the bow looks full enough for you, trim the bow from rest of the roll. The top part of the bow should look something like this. Use the bow tails you cut in Step 1 to secure the bow, where you have been holding. Wrap the center of the tails around the center of the bow, so the front of the bow looks like this. Tie a simple knot at the back of the bow. Pull the knot tightly to secure. Straighten out the two tails by pulling, as needed. Deco mesh tends to want to curl on its own. You can add a wire or string to the back for easy hanging. Use this big bow (about 20in x 45in!) as a door decoration, or to decorate a patio, porch or stair railings, or any other place that needs a festive accent. Deco mesh is durable and waterproof, so this bow will last through the elements without any re-fluffing. This makes is a great decoration for boat parades, lake houses or piers. Plan in making something like this with my mardi gras striped mesh! Thanks for posting, Lori and Jude. 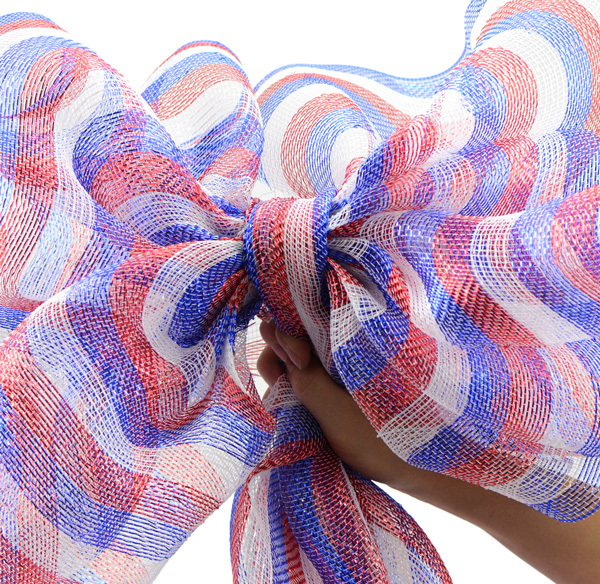 Its a versatile bow design, so you can definitely use it for Mardi Gras or any other holiday!